Gross Area: 134,500 sq. ft.
Area Per Student: 63 sq. ft. 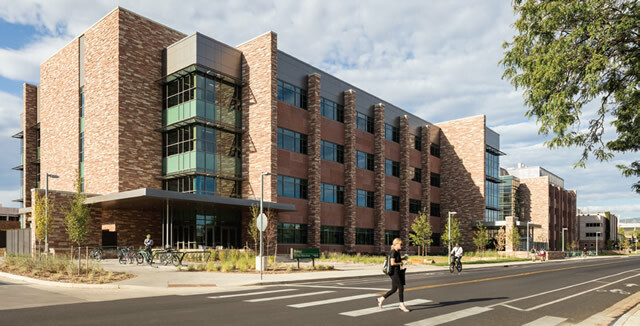 The new $58 million Biology Building on the Colorado State University (CSU) campus is a four-story, 154,000-square-foot teaching and research facility designed by Hord Coplan Macht. The firm recently completed both the Biology Building and a $41 million Chemistry Building. 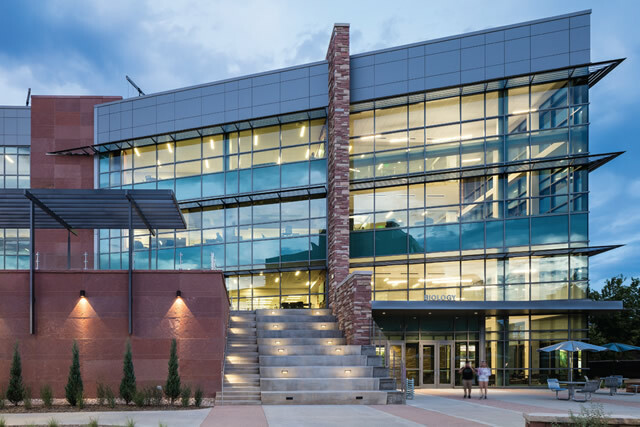 The two LEED Gold-certified buildings are the anchors of the growing CSU Science Commons and are adjacent to the future Health Education Outreach Center, which is also currently being designed by the firm. The biology building was designed to house the CSU Biology Department, including research labs, special collections used for teaching, faculty offices and idea space for collaboration. 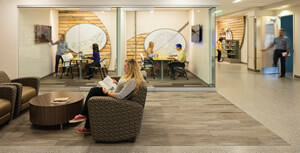 A large portion of the building is also dedicated to classrooms, teaching labs, student common spaces, advising and tutoring offices, and study rooms. The biology department is the largest in the College of Natural Sciences at CSU, with more than 1,400 undergraduate students studying in the Biological Science or Zoology majors. The project was completed by a design-build delivery method with Hord Coplan Macht as architect and Haselden Construction as general contractor. The biology and chemistry structures were built in tandem, utilizing different delivery methods, allowing both projects to minimize costs and create a thoughtful, new, unified Science Commons. The evolving CSU Science Commons includes bike and pedestrian paths, outdoor seating areas, native plant landscaping and an integrated storm water recapture system. 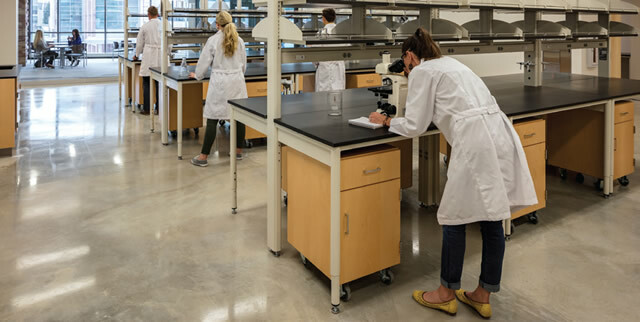 The new biology building provides opportunities for hands-on laboratory work for undergraduate students, both in class and in working with faculty members on their research. The “science on display” design of the building allows a view into the labs from the hallways through glass panels. The new Science Commons showcases CSU’s dedication to providing a state-of-the-art science education to their students. All three buildings focus on providing open and adaptable laboratories for researchers and their teams. All of the labs are daylit, where appropriate, with views to the outside making the spaces ideal for science exploration. The display walls are the strength of this project. The use of terrazzo is a good choice for both appearance and longevity. Nice use of materials.